The Omni King Edward Hotel was built in 1903 and is known as Toronto’s first luxury hotel. The Omni King Edward Hotel in nearby Toronto, built in 1903 and known as Toronto’s first luxury hotel, has announced the following packages and events. Stay at the luxurious Omni King Edward Hotel and explore Ripley’s Aquarium of Canada featuring North America’s longest underwater viewing tunnel. Located within walking distance from the hotel, this package includes tickets for each registered guest and complimentary in-room Wi-Fi. Visit https://www.omnihotels.com/hotels/toronto-king-edward/specials/stay-and-explore-ripleys-aquarium for more information. The last day of Spring Tea is June 16. Served Friday through Sunday from 1:30 to 5 p.m., you will revitalize and energize as the hotel’s chefs push the boundaries of savory and sweet while featuring their favorite flavors of the season to create the most refined afternoon tea experience. Spring Tea is priced at $54+ per person. Visit https://www.omnihotels.com/hotels/toronto-king-edward/dining/afternoon-tea for more information. Served Friday through Sunday from 1:30 to 5 p.m. during tea service and nightly in Consort Bar. This season, cheese lovers can rejoice with The King’s High Cheese. Enjoy a cheese plate along with sweet and savory pastries and scones, all featuring delicious cheeses from around the world. High Cheese is priced at $49+ per person. Visit https://www.omnihotels.com/hotels/toronto-king-edward/dining/afternoon-tea for more information. Offered from 10:30 a.m. to 2:30 p.m. April 21. Prices are $95 per adult and $47 for children six to 12; complimentary for children five and under. Celebrate the flavors of spring at Easter brunch set in the Vanity Fair Ballroom. Visit https://www.omnihotels.com/hotels/toronto-king-edward/dining/sunday-brunch for more information. Scheduled from 10:30 a.m. to 2:30 p.m. May 12. Prices are $95 per adult and $47 for children six to 12; complimentary for children five and under. Celebrate mom by bringing the family together for a memorable brunch experience set in the Vanity Fair Ballroom. Visit https://www.omnihotels.com/hotels/toronto-king-edward/dining/sunday-brunch for more information. Offered from 1:30 to 5 p.m. May 10-12. Priced at $75 and held in the Sovereign Ballroom. Treat mom to an Afternoon Tea experience fit for a queen this Mother’s Day, featuring a special menu just as sweet as her. 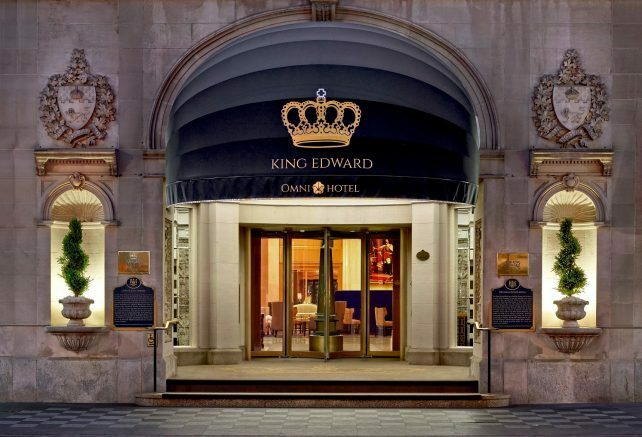 The Omni King Edward Hotel is located at 37 King Street East, Toronto. For more information, please call (416) 863-9700 or visit http://www.omnihotels.com/hotels/toronto-king-edward. Be the first to comment on "Toronto’s Omni King Edward Hotel offers several inviting — and delicious — events"